In Western countries, cardiovascular diseases represent the major causes of illness and death. Genetic factors play a key role in the development of such diseases. The objective of our research is to gain a deeper understanding of the pathomechanisms of these diseases and to develop new diagnostics and treatment strategies. For our genomic and functional investigations of cardiomyopathies, high-throughput methods are applied. This includes not only the analyses of basic mechanisms of cardiac contractility in the heart of the zebrafish, but also the decoding of whole genomes, transcriptomes and epigenomes using latest technologies. Using the combination of deep clinical and molecular phenotyping, multi scale models of the diseased heart can be established. Our research activities are an integral part of the German Center for Cardiovascular Research (Deutsches Zentrum für Herz-Kreislaufforschung ([DZHK]) and many other international research networks. You find our laboratory in the building of the Klaus Tschira Institute for Integrative Computational Cardiology, Analysezentrum III. The progress in genetics and the increasing knowledge about disease pathomechanisms has highlighted the importance of genetic diagnostics. The clinical significance is acknowledged by the German and international societies with new guidelines. 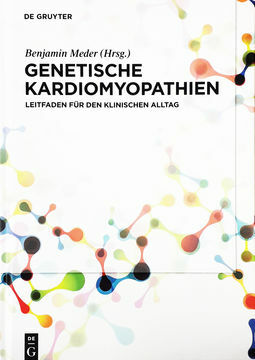 The book "Genetische Kardiomyopathien" provides a rich toolbox for the treating physician and cardiomyopathy specialist in German language. It highlights the possibilities of genetic assessment and family counseling by case examples and gives an overview on the current recommendations for interpretation of genetic variants.